Nicola is a Business Development Manager working with the Health and Wellbeing Institute, Global Challenges Institute and Business School. Nicola has worked in Education since graduating with a degree in Marketing from Durham University in 2014. She gained experience in events management, copywriting, project management, public speaking and organisational development and coordination before moving to South Bank University Enterprises Ltd. So far, she has helped a number of Schools improve their CPD offer and helped to drive enterprise related income for several different Schools. She is particularly driven by the variety involved in her role and the ability to make a difference with the work facilitated by REI. 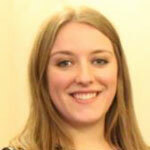 Nicola also works on the Armed Forces Covenant working group, chaired by Professor Paul Ivey. She has been a member of the working group since its inception in September 2016 and alongside several colleagues helped LSBU achieve Silver status in just 18 months. Nicola is also a member of the Race Equality Charter Committee and hopes this group can see the same success.